A professional speaker is a valuable investment in your meeting, trade show or conference. Because of their vast experience with meetings, professional speakers can often provide you with resources and advice for planning and marketing your event to improve your attendance. And because of the expertise they bring to the platform, professional speakers will typically wow your attendees, making them eager to attend more of your events in the future. Their logo can go in all the event marketing materials in two places: near the speaker’s information and somewhere else where all the sponsors are listed. That way they get double exposure. Their logo can go in the event program, again in two places: near the speaker’s information and with all the other sponsors. The sponsor can provide a giveaway (such as an advertising specialty or promotional item) to everyone in the audience. The sponsor can have an exhibit table. A representative from the sponsor organization can introduce the speaker and even do a short promo right before the speaker is introduced. Many professional speakers will also include the sponsor’s logo in their PowerPoint slides and/or their handouts, thus keeping the logo in front of attendees throughout, and even after, the presentation. “We can’t charge more,” association executives tell me. “Our members are cheap! They won’t pay more for our events.” Yes, they will. If your members aren’t paying to attend your events, odds are it’s because they don’t see the value in them. Which means either there isn’t enough value in your events to make it worthwhile for them, or the value isn’t being communicated well enough through your marketing. Fortunately, many professional speakers can help you with both issues. When you provide tremendous value and you market it effectively, people will eagerly pay more. It amazes me that associations of all kinds will spends thousands of dollars on food, décor, entertainment, lighting, printing, awards and even alcohol, but don’t budget anything for the one element that will make or break their event. Let’s be honest—a year from now, nobody’s going to remember what they ate. But if the speaker helped them solve a problem or inspired them to take a risk that paid off or gave them tools to help them prosper, you can bet they’ll remember that. So how can you reallocate your event budget? What line items can you trim to free up money to spend where it counts? 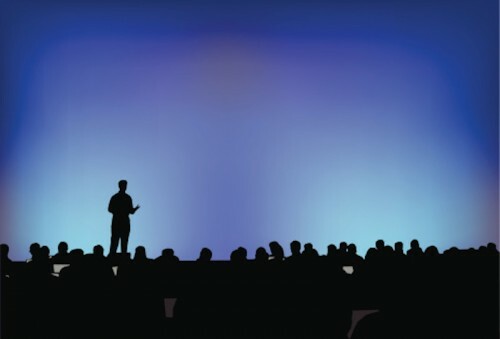 It’s better to have a barren stage with a fantastic speaker, than a beautifully decorated stage with a lousy speaker. Most speakers’ fees aren’t cast in stone. But negotiating doesn’t mean simply asking someone to drop their price. That isn’t fair to the speaker or their other clients. A good speaker brings value to your organization. So if you can’t afford their full fee, you need to offer value in exchange. Perhaps you could direct mail the speaker’s information to your mailing list. Or provide them with extra days at the venue along with their spouse or partner. Or give them a large, full-color ad in your directory or web site. Or videotape the presentation, sell it to your members and split the proceeds with the speaker. Each of these items costs you little or nothing, but have potential value to speakers. And if you spend some time brainstorming, you can certainly come up with other ideas as well. Figure out which ones would be most appropriate and run them by your prospective speakers as you discuss fees. Keep in mind, the deeper the discount you’re requesting, the more value you need to offer to make things equitable. When it comes to the content of your meeting, you want to give your attendees the best. Which is why investing in professional speakers makes financial sense. The better the programming you offer, the more registrations (and more revenue) you’ll get. Marketed effectively, professional speakers can more than pay for themselves. And when you employ one or more of the above strategies, they can be more affordable than you ever thought possible. © Don Cooper, The Sales Heretic™. Don Cooper—The Sales Heretic™—helps salespeople, business owners and professionals dramatically increase their sales. He conducts seminars, trains sales and customer service teams and speaks at annual meetings, conferences and conventions. Contact Don at 303-832-4248 or visit www.DonCooper.com for more articles, tips and tactics.